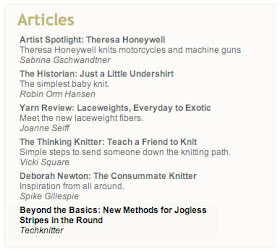 update, February 2011: The article previewed below is now serialized in TECHknitting blog, beginning here. 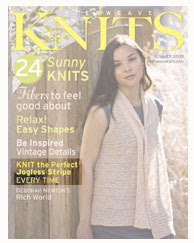 Among the wonderful articles and patterns in the upcoming Summer 2009 issue of INTERWEAVE KNITS, there will be an article by TECHknitter (that's me!) on the subject of Jogless stripes. Parts of the information covered has been seen before, but in a different format and with different illustrations (click here). In the magazine, this information is re-presented with all-new illustrations. Not previously covered on TECHknitting blog and new to the magazine is instruction on jogless barber-pole (aka helix) stripes, with a neat trick for making this kind of stripes easier (much easier!) as well as a trick for making the elusive single-row jogless stripe. Pick up a copy and see for yourself--on sale May 5th, or by subscription (click here).